Petal Fall Insect Complex: An OFM biofix was set for April 20 in southern counties. Treatments for the first flight will be due at 170-200 degree days after the first trap captures or “biofix.” According to the NEWA weather station in Upper Deerfield, we have had 49 degree days accumulate since 4/20. This timing usually coincides with late petal fall to shuck split, however we are a little late this year, since we have about 120 degree days to go until the first OFM treatment. Since we are still waiting for the OFM timing, the initial petal fall spray will primarily target plum curculio, tarnished plant bug and other catfacing insects. Plum curculio is active, and will feed on blossoms and freshly set fruit. See last week’s newsletter and the Tree Fruit Production Guide for insecticide options. Given the current insect targets, Avaunt is one of the better materials for plum curculio (PC) at this time, and also covers Oriental fruit moth and tarnished plant bug. We are not concerned with BMSB at this time, so many of the other materials which are effective for BMSB can be saved for later in the season. Green Peach Aphids (GPA): GPA colonies begin forming sometime during bloom. Examine trees for the presence of colonies from pink to shuck split. Count the number of colonies on ten trees and use a treatment threshold of 2 colonies/tree at petal fall for peach, and 1 colony/tree for nectarine. See last week’s newsletter for more on GPA. Bacterial Spot: Treatments using copper formulations or terramycin should start at late petal fall to shuck split. Late sprays in the presence of warm weather often mean that an intended application at late petal fall really can occur at shuck split. In this event, it’s better to error on the early side and include something for bacterial spot. Some growers find it beneficial to start the bacterial spot program with an antibiotic, then switch to a copper program. Some growers will only use coppers. Regardless of the approach, treatments are best applied just prior to bacterial spot infection periods. Fruit will be very susceptible at shuck split. See the production guide for recommended materials and rates. Coppers include Kocide 3000 @ 1.5 oz/A, but also Champ, Copper-Count-N, Cuprofix, Cueva, and Nu-Cop. Watch your rates, since these can all be phytotoxic, and the same conditions (cooler weather with slow drying conditions) that make antibiotics more effective because of increased uptake, also can provide better conditions for copper phytotoxicity. Avoid Captan/copper tank mixes if it is very hot or has been overcast for several days in a row, or if applying at low volume. Rusty Spot: An effective material should be included at petal fall, and continue through 2nd cover on rusty spot sensitive varieties. Rally at 2.5 – 5 oz./acre is the standard and most effective product. Other effective materials include Gem, Inspire Super, and Quadris Top. Both Gem and Quadris top will control all diseases at petal fall. Spotted Tentiform Leafminer (STLM): Adults are flying, but are not considered a pest target at this time. This is one of the most highly parasitized insects in the orchard. We have not seen a real problem with this insect during the past 5-6 years. European Apple Sawfly (EAS): This insect is active and will be active through bloom and into petal fall and first cover. Adult females lay eggs just under the skin of freshly set fruit, and the young larvae mine just under the skin. Where this insect is active, it is a primary target at petal fall. In orchards of mixed variety plantings, petal fall for the entire planting is prolonged. This enables EAS to start damaging the first varieties where petals fell before a petal fall spray is applied to the entire block after all petals have fallen. In this case, Assail applied at the pink bud stage, coupled with the normal petal fall spray will control EAS. Diseases: Apple Scab, Powdery Mildew, Cedar Apple Rust, are diseases of concern at this time. The wetting conditions due Thursday 4/30 may produce a scab infection period, although the current forecast indicates not much rain. The NEWA scab models are predicting about 50% ascospore maturity during this period in southern NJ and about 20% maturity in Hunterdon County. 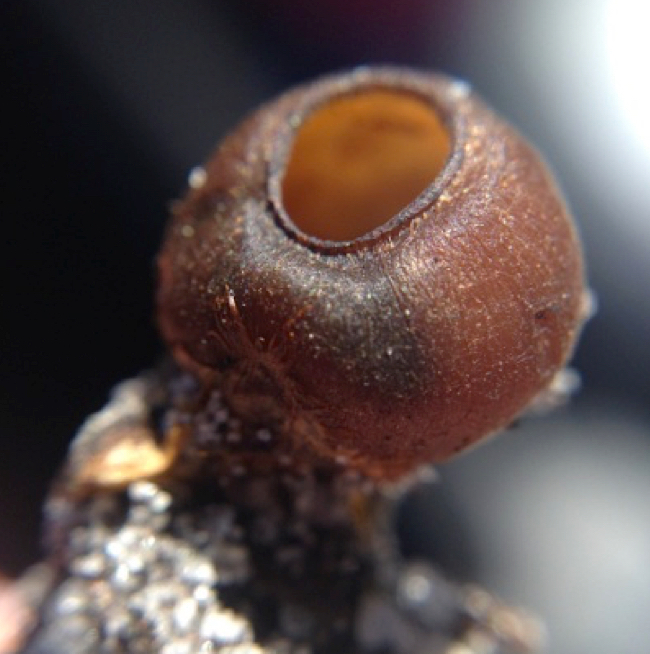 Primary apple scab spores are released during any substantial wetting and infection period. Cedar apple rust infections can occur anytime between pink and 3rd cover. Pear Psylla: Pear Psylla nymphs began hatching last week in southern counties and are hatching this week in northern counties. Nymphs will feed on developing clusters through bloom. Cranberry Weevil (CBW): We continued to find adult cranberry weevil activity over the past week. The percentage of sites with CBW activity decreased from 72.3% the week of April 13th to 50.0% for the week ending April 24th. In addition, fewer sites had CBW activity over threshold. Last week 4.6% of the sites monitored were above threshold, whereas only 1.1% of sites were over threshold for the week ending April 24th. The decrease in activity is likely due to growers making treatment applications when CBW was over threshold at their location. The threshold level for adult CBW is an average of 5 weevils per bush. 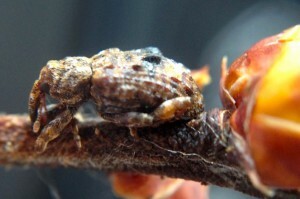 Plum Curculio (PC): Our first capture of adult plum curculio was on Monday April 20th (Figure 1). We continued to find adults throughout the week in low numbers. Maximum count was 2 adult PC per site. At this time, all PC adults have been found in Atlantic County. Adults are monitored for in a similar way to CBW, using the beat sheet method. Ten blueberry bushes are sampled in a given field and the average number of adult PC found is recorded. Currently there is no known threshold for adult PC. Chemical controls targeting the adults should be applied soon after bees are removed. Post-bloom control options include Avaunt, Danitol, Brigade/Bifenture, Hero, Mustang Max, and Imidan. Exirel is also labeled this year, but may be better placed for SWD season. Mummy Cups: A number of mummy cups were located at multiple locations in Burlington County for the week ending April 24th. The first mummy cups were located on Wednesday April 22nd. We found no primary mummy strikes and cups at only 3.3% of sampled sites, or 6.5% of the farms being monitored. The mummy cups were found in wet, poorly drained, and lightly worked areas of the fields. Fungicides that target mummy berry include: Indar, Orbit, Proline, Pristine, Quash and Switch.